We’ve finally reached the Abortion Foe Event Horizon, the point at which all Republican candidates, in their ceaseless quest to prove they hate abortion the very most, have begun collapsing into a black hole of their own hyperbole. First up: Mike Huckabee, who said when he becomes president, he’ll send in the American armed forces and/or the FBI to stop abortions. Both amendments contain due process protections against depriving people of life without due process of law. But he argued that scientific advancements have now verified that unborn babies are human beings — information he said wasn’t necessarily available when the Supreme Court issued its 1973 Roe v. Wade decision. 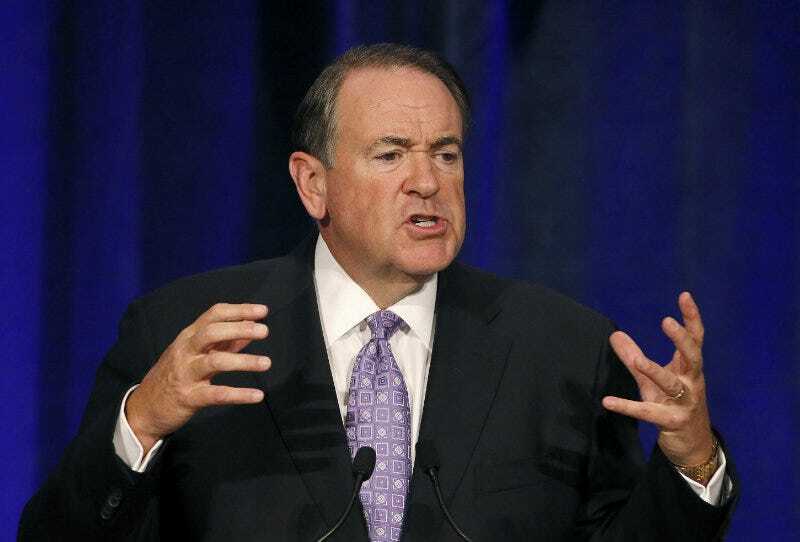 “I will not pretend there is nothing we can do to stop this,” Huckabee said at the event, where a Topeka Capital-Journal correspondent was present. This — this right here — is a candidate proposing a literal, actual, armed war on women. Thank goodness he’ll never be President.